Have you figured out yet that I’m excited for conveyor belt sushi from Singapore? It’s not open yet, but after much begging, they finally let me into Sakae Sushi (43rd btw. Lex+3rd) last night for a first look at the conveyor belt and computer system (which they’ve been putting together all week). The belt itself, which snakes in a u shape around the entire restaurant, carrying little small plates of sushi to every table, doesn’t actually go back into the kitchen- where all the food is prepared. There are no sushi bars either. All the food is made in the back, and brought out by servers to be placed on the conveyor belt. 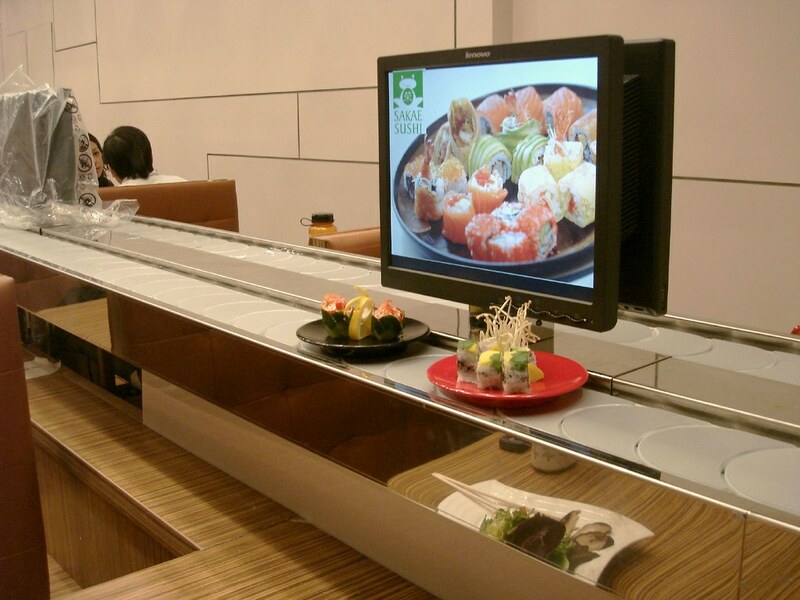 For those “crazy” people, who don’t want to eat sushi off a conveyor belt, there is a mouse operated computer at each table you can use to order anything off of the menu. 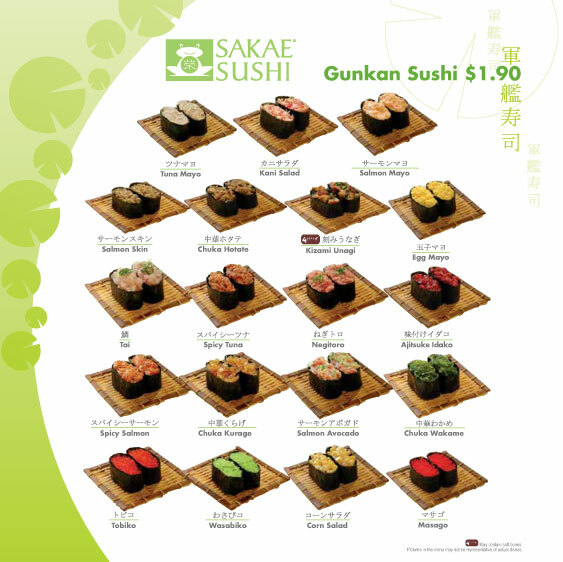 This not only includes freshly made small plates of sushi, but larger things that don’t fit on the conveyor belt as well. To see the full 30 page menu, click here. 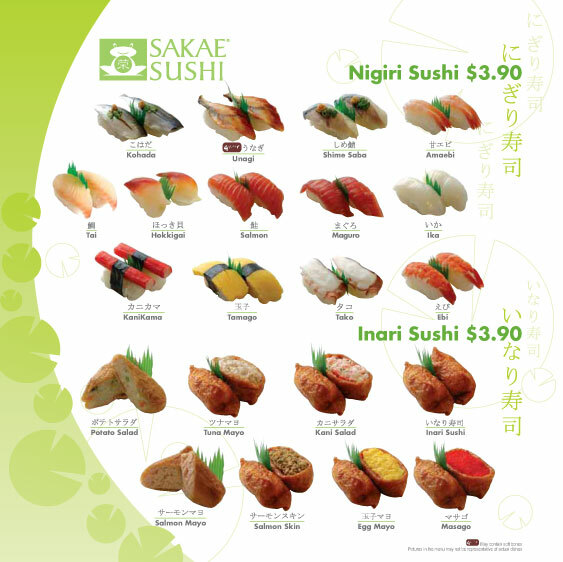 If you’ve been to a Sakae Sushi overseas, you may end up disappointed by the first US location which lacks some of the uniqueness or “cool” factor of the locations in Asia. That’s because they felt a more subdued location would be more appealing to the clientele of Midtown. See what the losers have done? Even when we get something cool, we get screwed. According to their publicist the restaurant is still on track to open on Friday, but not until dinner time, meaning (if it actually happens) Tuesday should be our first chance for an official “Midtown Lunch”. See you there? Posted by Zach Brooks at 3:17 pm, January 17th, 2008 under 43rd btw. Lex+3rd, Sakae Sushi, Sushi. Do any of you old-timers remember GENROKU? The original NY conveyer belt sushi place on 5th Ave & 35th Street, long closed? That was 20 years ago and it was tough to get out for under $10. Zach, you better budget for 4 days of peanut butter after a visit to Sakae. That frog beats Teriyaki Boy in the Adorable Games! Hands Down! If that was a London sushi house there would be a russian ouside with a geiger counter. 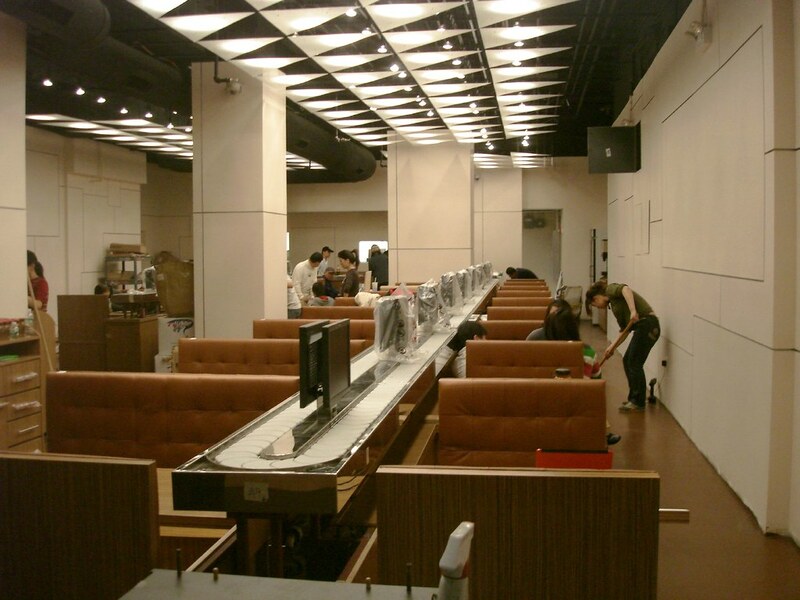 Is this the only conveyor-belt sushi place in the city? In So. Cal these things are all over the place. Pretty pumped to go there! Ha were they curious why you were so interested in “checking it out”? Zen Burger,……..Salad…..now Sushi……..what horror’s doth await us tomorrow? I may have to send Zach my profile………….just to….you know be the ying to his yang. Zach, you’re so lucky to have a sneak peek of Sakae Sushi! There is a conveyor belt sushi joint on 3rd ave in the 20s: East. Usually, it’s tough to get a table by the belt…and the sushi, from what I remember, was ok, nothing fantastic. There was a conveyor belt sushi place on 46th between 5th & Madison only a couple of years ago. It’s now … shocking … a Starbucks. the Bowery Whole Foods has a conveyor belt sushi set-up, but what’s the point? the sushi is fresh, of course, but not imaginative or interesting. And you can’t get up from that bar, full, for less than $20. Really not worth it–and yet I loved Genroku and the place on 46th! And the branch of Genroku at the White Plains Galleria, which actually was very inexpensive! there’s been a sushi conveyor belt at east sushi around 27th and 3rd for ages. This place is located on the block where I work, and I couldn’t be happier. I think it WILL be possible to do a $10 lunch here. 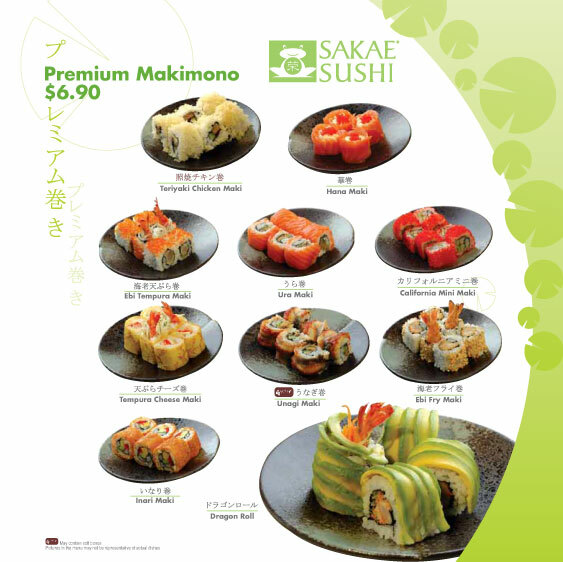 The menu indicates that there will be 6-pc, simple rolls for $1.90… am I wrong here? They are labelled Makimono. For light eaters, three of these rolls would run you under $6… fice would be under $10, and I could see five small rolls being a simple, somewhat filling lunch. Can’t wait to try this place when it opens, although I may wait a few days before I head in… nothing worse than eating at a restaurant on its “soft-opening”…. PS, I just found out about this site and it is definitely a new favorite — bravo! I seem to recall seeing a conveyor belt restaurant in Saks Fifth Avenue–am I imagining this? Yes, the Charbonnel et Walker Chocolate Bar on the 8th floor of Saks Fifth Avenue NY has a counter with a conveyor belt. Pretty much any maki roll sushi with fish and fish eggs and avocado wrapped on the OUTSIDE is B.S. sushi. I like this place a lot too, it used to be my after watching football on Sunday’s spot. Lucky for me this new place is in the building where I work so I will deff be checking it out, I’ve been walking past there eying it for quite some time now. “Zach, you’re so lucky to have a sneak peek of Sakae Sushi! 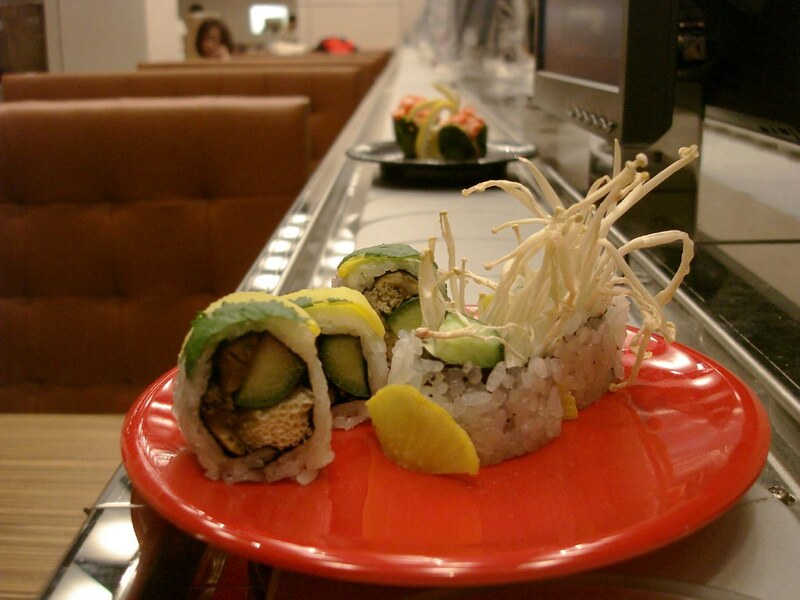 About 15 years ago there was a place in the village called Tsunami on West 3rd that had a conveyor belt.